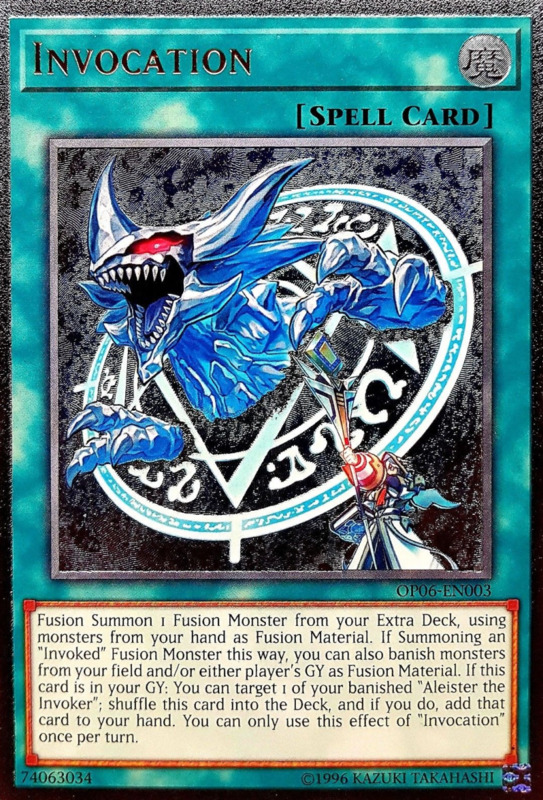 The original Yu-Gi-Oh extra deck monster, fusion cards lay dormant in your always-available extra deck, usually requiring a fusion spell and the proper material monsters to summon. Most fusions allow you to summon the titan using monsters from your hand, a useful trait not shared by xyz, synchro, or link creatures. Of course, a fusion monster is only as good as the magic that summons it—let's learn how to play with the ten best cards that access your violet army! 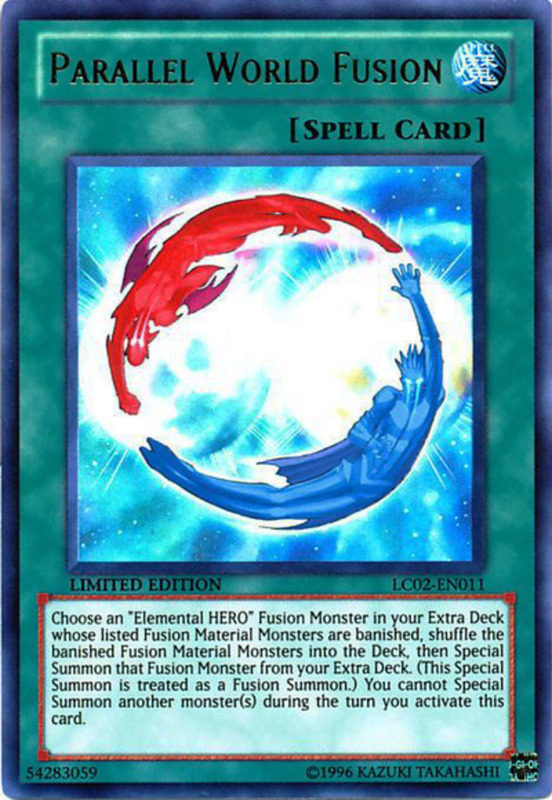 Unfortunately, Parallel World Fusion can only summon Elemental HERO monsters, but it possesses a very rare trait: the ability to recover banished cards. 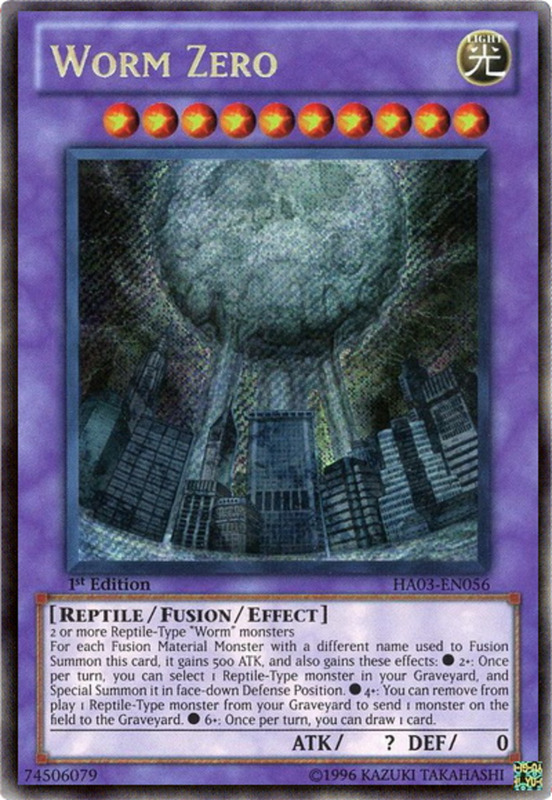 When the spell activates, you shuffle banished material monsters for a HERO (yes, HERO is always capitalized, and yes, it's annoying, Konami) fusion card into the deck and fusion summon that HERO. While the materials don't go directly to your hand, you're restocking your deck with cards that would otherwise be removed from the game, prepping yourself for future fusions. Plus, although the Elemental HEROs are an aging archetype, don't think they wield no competitive edge. For instance, Elemental HERO Absolute Zero destroys all opposing monsters when he leaves the field for any reason—essentially giving you a free Raigeki—and his strong ATK vanquishes many a foe. Arguably the fan favorite of all monster types, powerful dragon monsters come in many shapes and sizes and offer several fusion options. 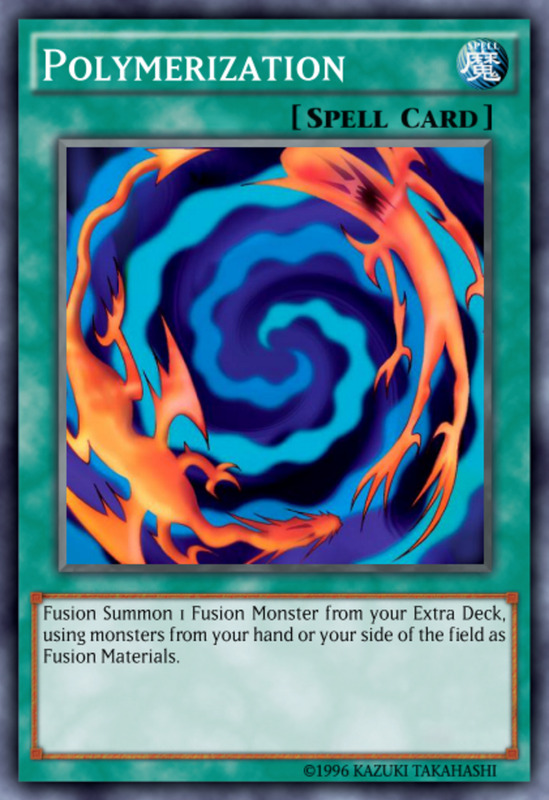 Now, the downside to typical fusion summoning is how it greatly diminishes your hand and/or field, as you usually spend one fusion spell plus two or more monsters just to summon a single creature. Dragon's Mirror counteracts this issue by using resources from the field or graveyard (not hand), allowing your vanquished monsters to serve you one last time. However, keep in mind the materials will be banished, so be sure to only spend cards you aren't planning on recycling later. 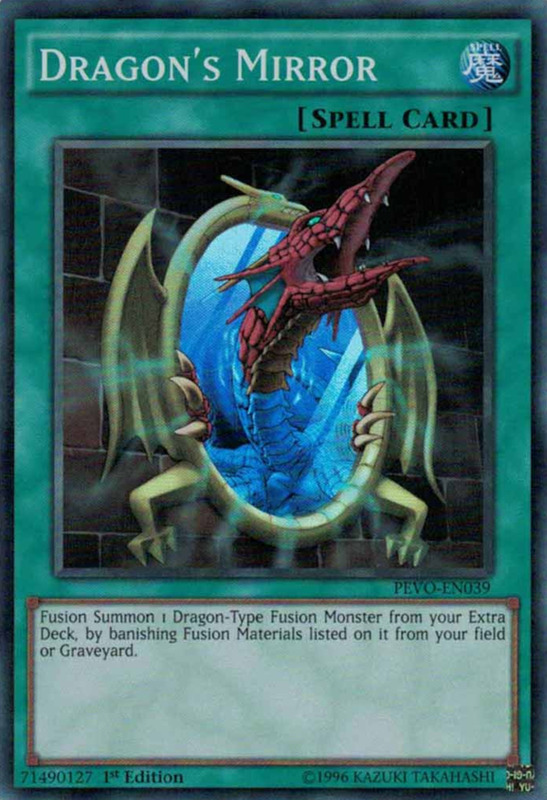 Also, note the wording of Dragon's Mirror—the fused monster must be dragon-type, but the materials themselves don't have to be (as long as they fulfill the requirements), letting the Mirror call upon formidable beasts like Red-Eyes Slash Dragon. Our next spell—oh? Here we have a rare fusion trap, this one geared towards the Frightfur series. 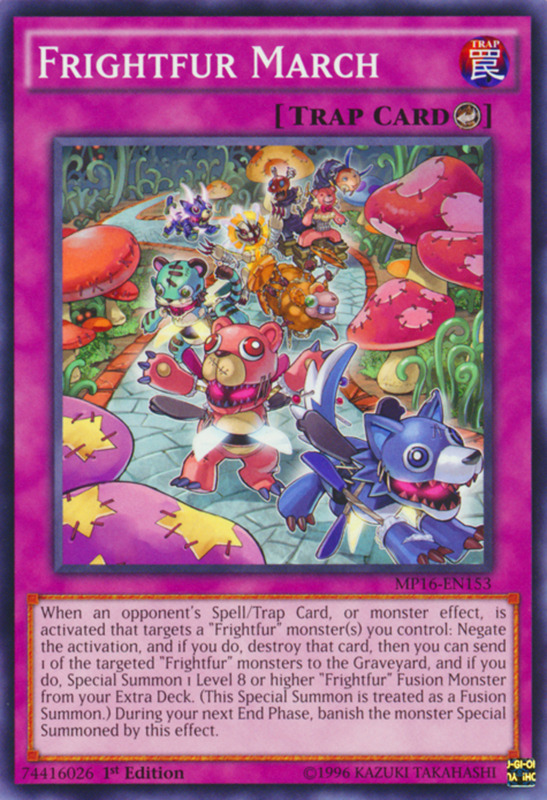 The trap begins as a sweet barrier for your Frightfur team: brandish it when an opponent activates a card targeting one (or more) of your Frightfurs; March will negate and destroy that effect. Then, you can send one of the targeted monsters to the Graveyard and special summon a level 8 or higher Frightfur fusion monster! The only downside of this card is that you have to wait for your opponent to target your squad before you can trigger it, but Frightfur March gives great bang for your buck by both defending and fusing your allies. 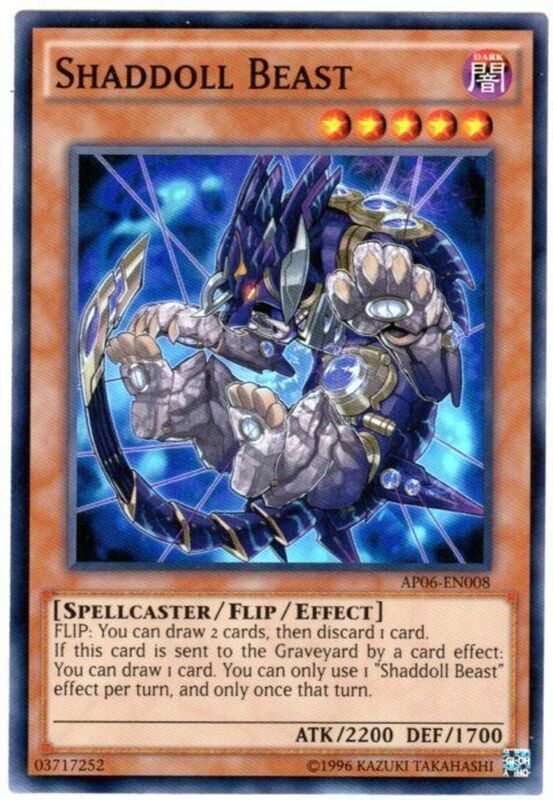 Use it to summon awesome creatures like Frightfur Chimera, who normally needs three materials, using only one! In the trading card game, Super Polymerization is not banned, but it is limited (only one per deck), and we can easily see why. 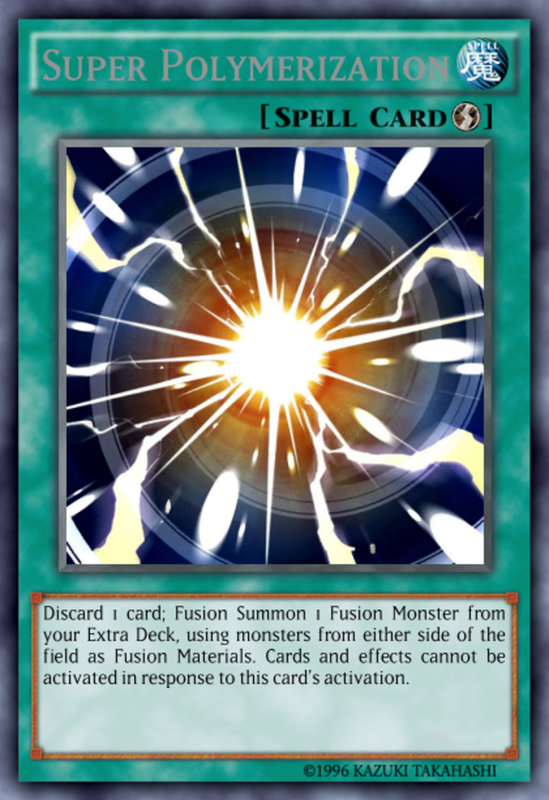 By discarding a card, you're allowed to perform a fusion using monsters on either side of the field as material. Plus, cards and effects cannot be activated in response, preventing an untimely card negation. 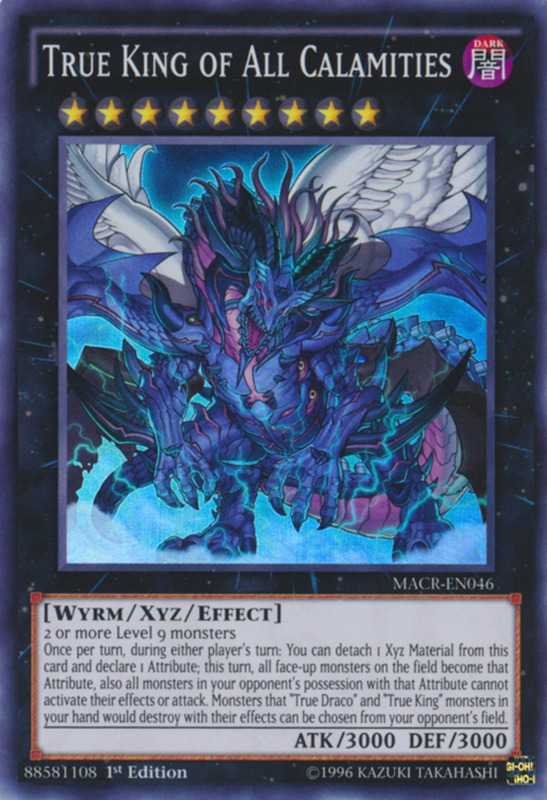 Because it can access both sides of the field, Super Polymerization works best with fusion monsters like Chimeratech Overdragon, who accept monsters of more-general types or attributes rather than those with specific names. Use this feared combo to simultaneously wipe your opponent's field while filling yours with a formidable monster. 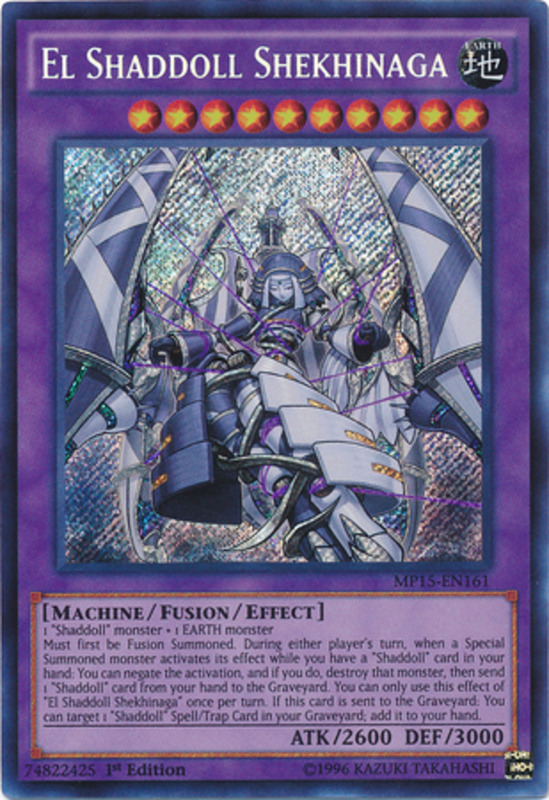 The Shaddolls heavily gravitate towards fusions, making a superb fusion spell like this a must. 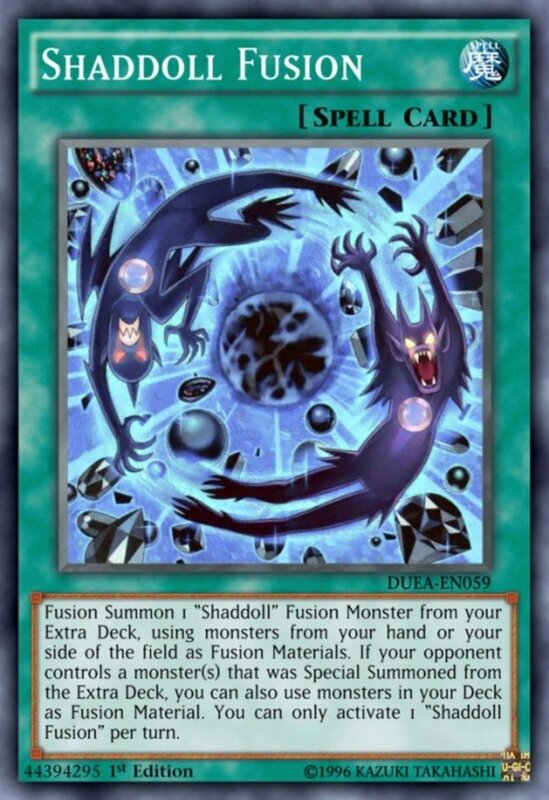 Its first effect basically serves as a normal Polymerization: you can use materials from your hand/field to fusion summon a Shaddoll monster. Simple enough. However, you'll likely want to wait until the second condition becomes active: when your opponent controls a monster special summoned from the extra deck, you can also use monsters in your deck as material. Like Dragon's Mirror, this helpfully keeps your hand and field full, and unlike most cards that rely on your opponent's field, it doesn't matter whether your own field is empty or full at the time of activation. Finally, note that Shaddolls have effects that trigger when they're sent to the graveyard, meaning your opponent will have to deal with both your shiny new monster and the last breaths of your materials. The Gem-Knights are all about rapid-fusions, and this spell is easily recycled to facilitate several amalgamations. 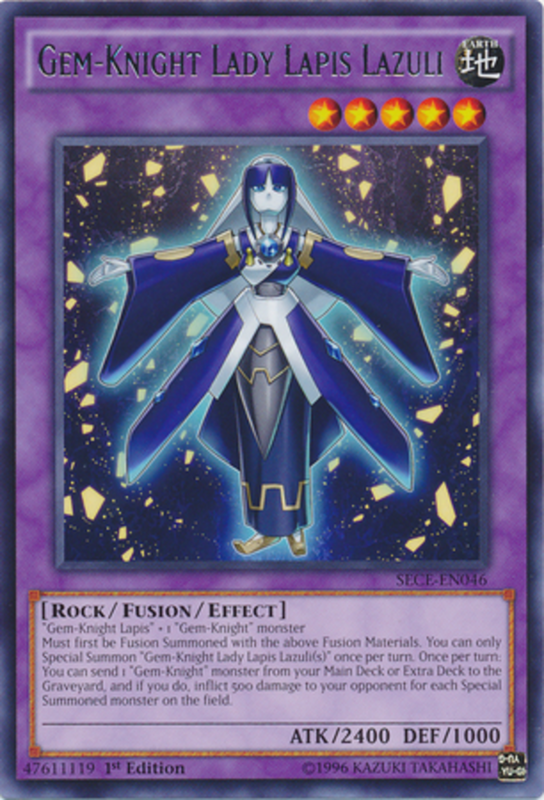 Basically, this is the standard fusion spell, using materials from your hand/field to fuse a Gem-Knight (I recommend Gem-Knight Lady Lapis Lazuli), but the added effect lets you reclaim this card from the graveyard by banishing a Gem-Knight monster from the graveyard. 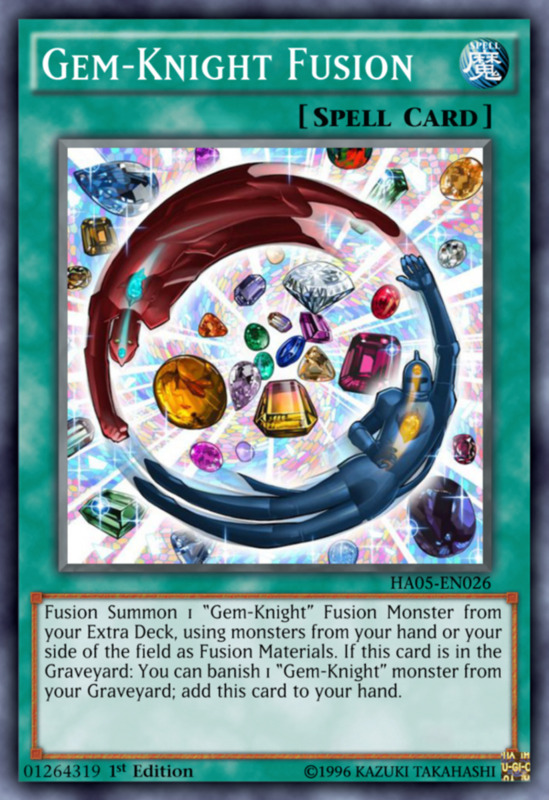 Considering their aptitude as material, your graveyard should quickly fill with Gem-Knight fodder, giving you numerous fusions from this single card. And although banishing monsters is typically undesirable, the Gem-Knights offers a few methods of reclaiming their departed comrades, mitigating the issue. 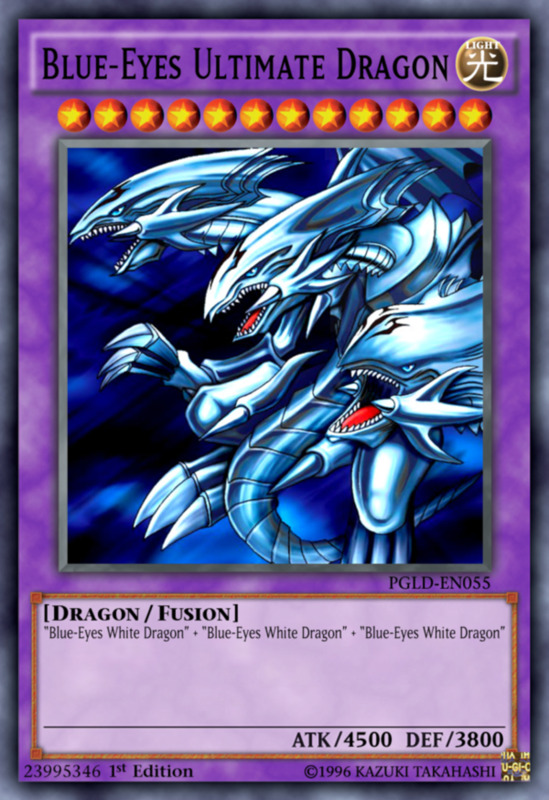 Despite its name, Odd-Eyes Fusion can summon any dragon-typed fusion monster, not just Odd-Eyes beasts. It normally uses the de facto hand/field fusion materials, but if your opponent controls at least two monsters while you control none, you can also utilize Odd-Eyes cards in your Extra Deck! 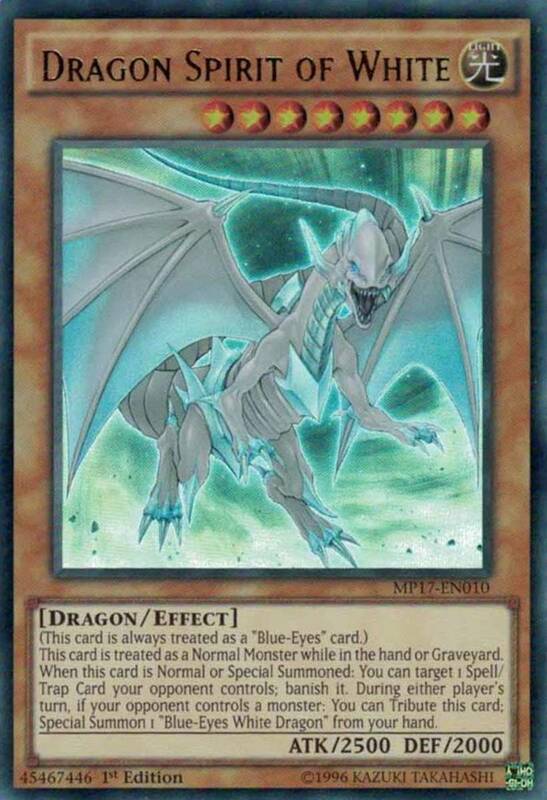 This keeps your hand full and provide extra incentive to nestle xyz cards like Odd-Eyes Rebellion Dragon or Odd-Eyes Absolute Dragon in your extra deck. 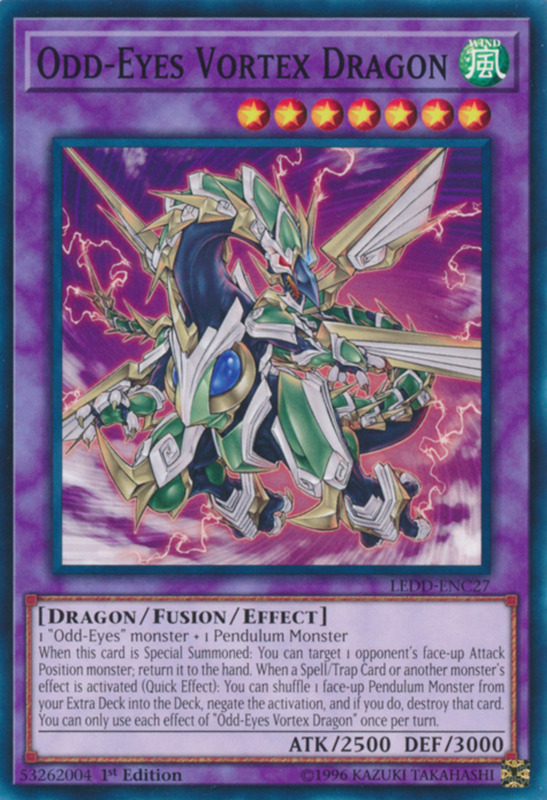 As icing on the cake, the Odd-Eyes family enjoys several powerful fusion options, my favorite being Odd-Eyes Vortex Dragon, a monster with great DEF who can also negate opposing effects. Although pendulum summons have lost prominence thanks to the changes implemented alongside the debut of link summons, check out the prowess of an example Odd-Eyes deck here! Uncharacteristically, Invocation can fuse monsters of any series, but requires the materials be in the hand (not the field). However, you'll likely be playing this alongside the Invoked archetype; when you use Invocation to summon an Invoked monster, you can also banish monsters from your field or either graveyard as material. This provides plenty of zones to fuel your fusion, including the great option of banishing your foe's graveyard. To compound these already-great effects, if this card is in the graveyard, you can shuffle it into the deck to return a banished Aleister the Invoker to your hand. What else can I say; Invocation simply offers a plethora of effects to suit your fusion needs. A card long banned for its fierce powers, Future Fusion (as of this writing) is completely unrestricted in its deck usage. It usefully pulls all materials from your deck, keeping your hand/field stocked, and equally synchronizes with all archetypes. 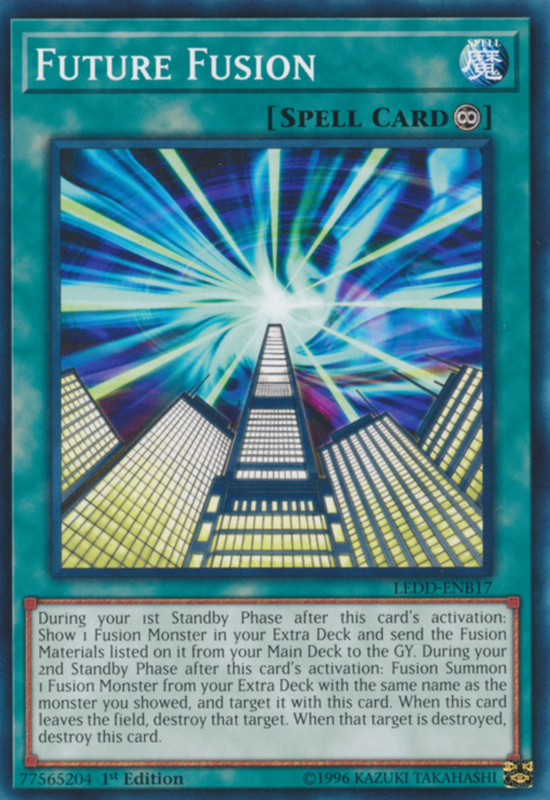 Admittedly, you have to wait until two of your standby phases (at the start of your turn) pass before the monster appears, and if Future Fusion leaves the field, the monster will be destroyed, but these are small trade-offs for such power. 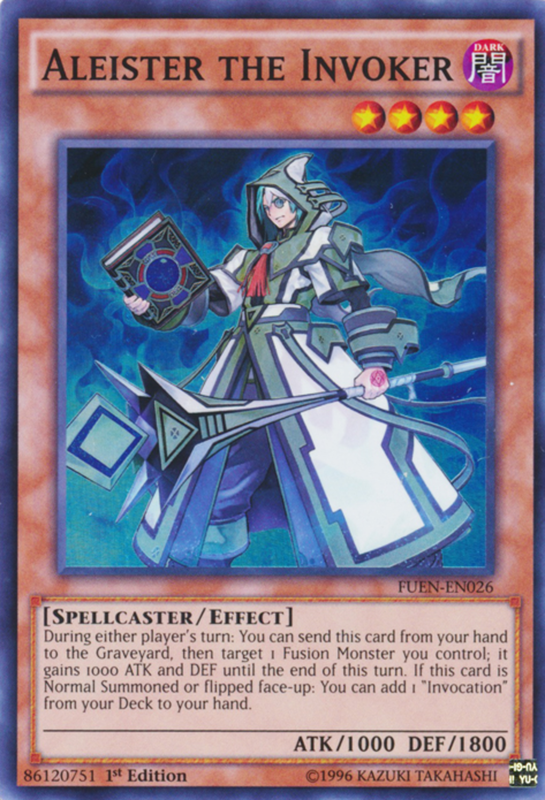 Additionally, consider that Future Fusion fills your graveyard with monsters, perfect for the thousands of graveyard-dependent effects in the game. 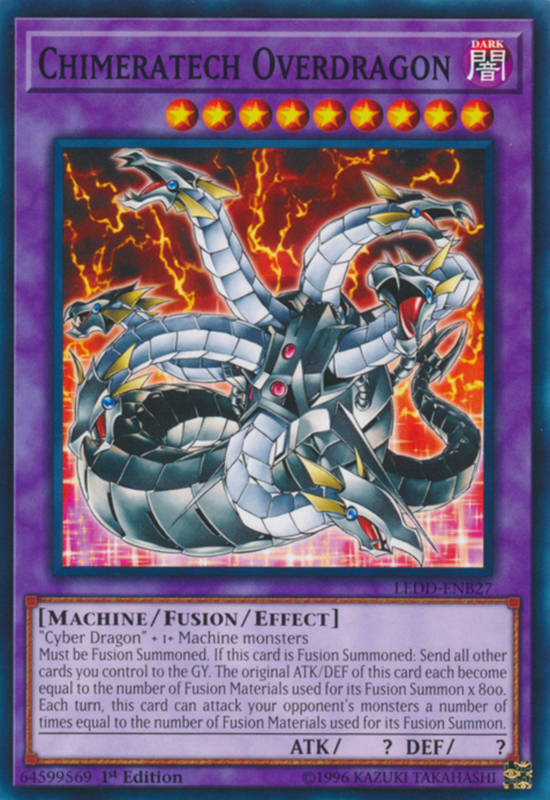 And with cards like Worm Zero, who have no limit to the number of fusion materials, remember that you're eradicating as much of your deck as you want, perfect for eliminating the fluff and guaranteeing quick drawings of your desired cards—especially the Exodia components. Yep, the original (and poorly translated) fusion card earns top spot. But we're doing more than paying homage to this classic spell; Polymerization remains surprisingly relevant in the tcg despite its apparent lack of bonus effects. 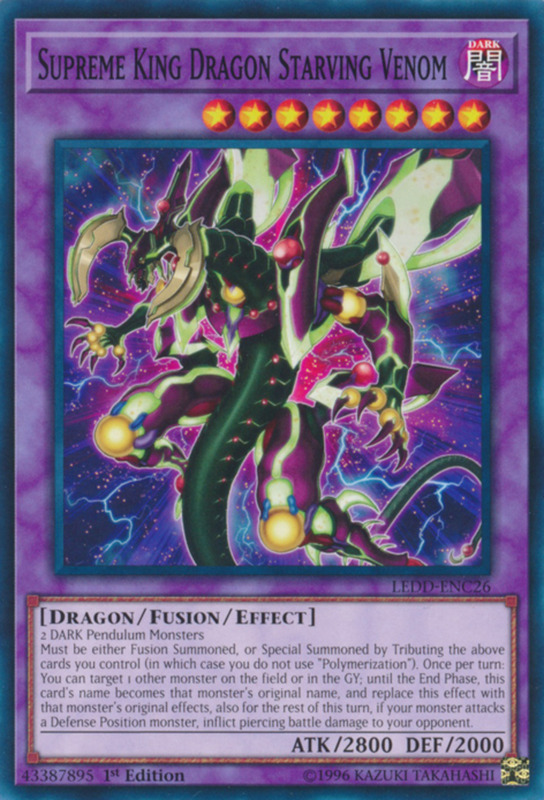 First, it can fusion summon any monster regardless of archetype, from Blue-Eyes Ultimate Dragon to D/D/D Oracle King d'Arc, but more importantly, Polymerization enjoys the most support of all fusion cards. Many monsters and traps can search it from the deck, recover it from the graveyard, and apply all sorts of wacky shenanigans with it. On its own, the card may not dazzle as much as others, but with its numerous synergies, Polymerization can repeatedly catch unsuspecting opponents off guard. With the right synergies, this is a versatile card that I cram into many of my own structures, and it's thankfully pretty cheap, costing under three dollars. Although many newer summoning methods have arrived since fusion's debut, it enjoys a staggering amount of new support cards and shouldn't be overlooked when deck-building. Experiment to find which spells (and even monsters) work for you, but be sure to try these ten—I doubt you'll regret it. But for now, as we eagerly await Konami's next batch of fusion spells and powerful fusion monsters, vote for your favorite entry and I'll see you at our next Yu-Gi-Oh countdown! Why isn't Brilliant Fusion in this list of top fusions in Yu-Gi-Oh? That is a good (or should I say brilliant) suggestion; however, it has its disadvantages. 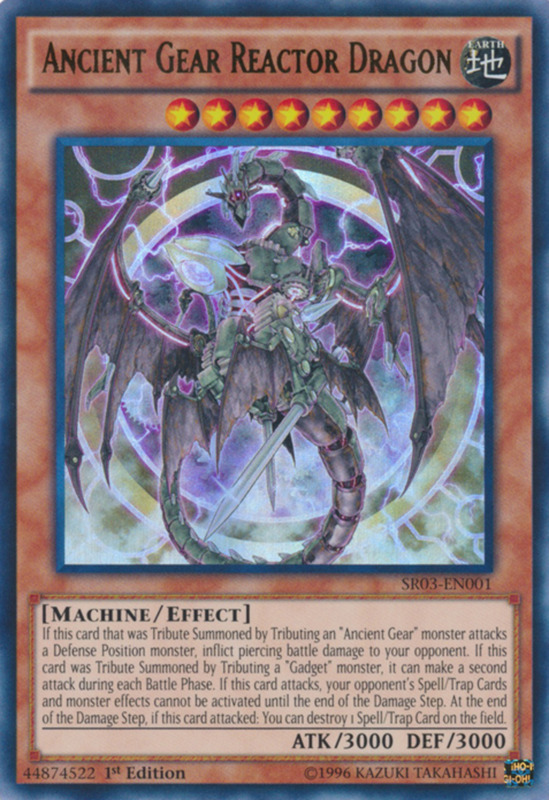 Brilliant helpfully accesses your deck for materials, but only works with Gem-Knight fusion monsters. Not only that, it reduces the summoned monster's ATK/DEF to 0 (which can be briefly reversed by discarding a spell) and attaches to it, giving your opponent another method of removing your warrior. Still, it's a useful card, and I appreciate your input. 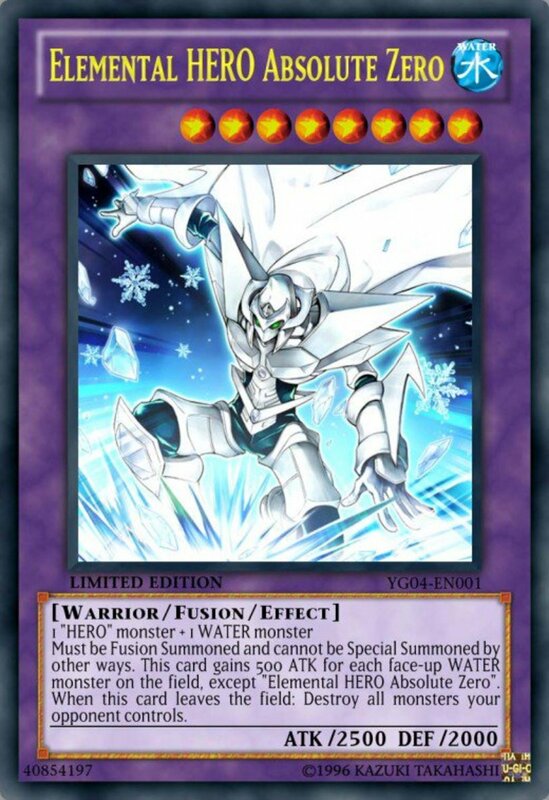 What about including Ancient Gear Fusion with the Yu-Gi-Oh deck? Using monsters from the deck is really powerful. It is, and in fact, AGF is in my notes if I ever do a follow-up countdown. That said, you haven't mentioned its disadvantages. 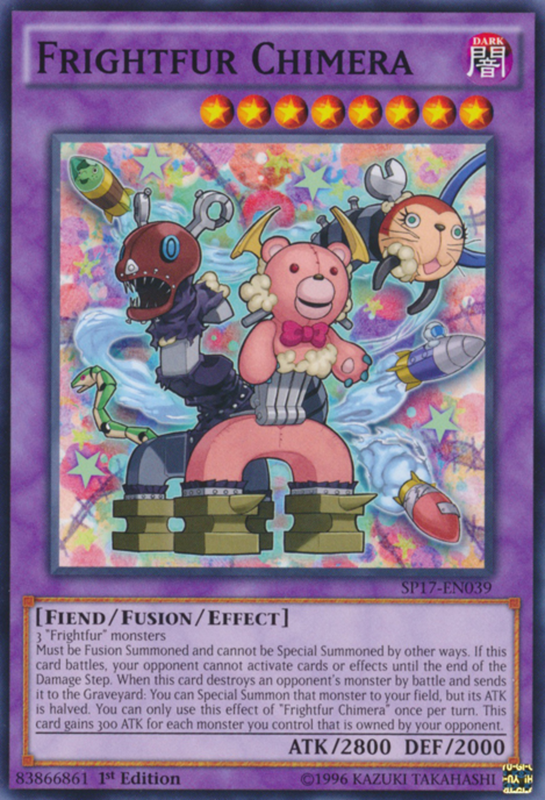 First, it can only be used on Ancient Gear monsters, so it's archetype-dependent, and you can only use monsters from your deck as material if you spend a fielded Ancient Gear Golem or Ultimate Pound as material. And those are high-level monsters who can take a bit of effort to summon. Don't get me wrong, AGF is still a great card; I just opted for other units due to these restrictions. Depends; many cards offer support for searching out Polymerization, but if you're using cards like Future Fusion or Dragon Shrine that quickly fill your graveyard, I'd go with Dragon's Mirror. I like necro fusion, because it lets you summon monsters from the graveyard, which gives you a lot of fusion materials to choose from. 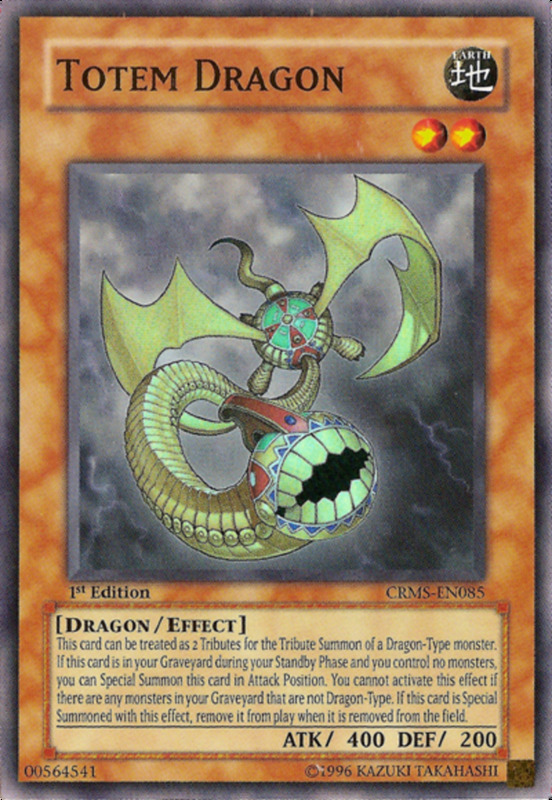 As a fan of Evil Hero Dark Gaia, I feel that Dark Fusion should get a mention. 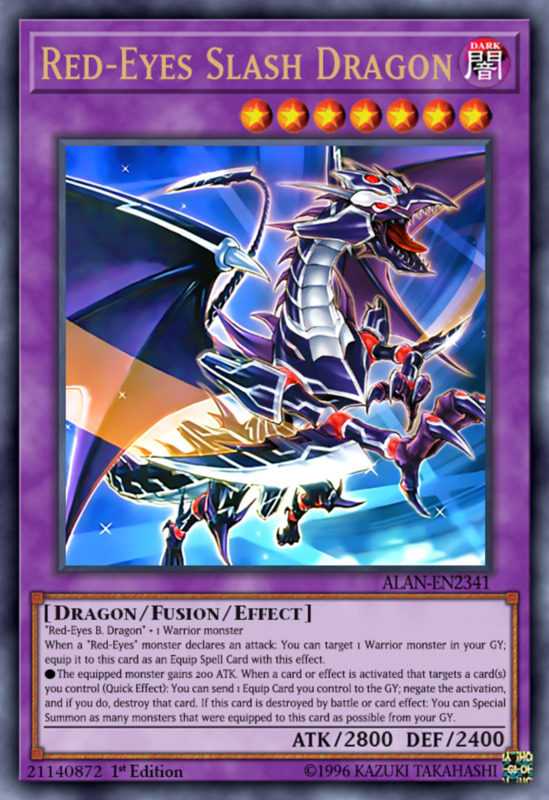 Odd-Eyes Fusion can summon all dragon fusion monsters, not just "Odd-Eyes" members, but can't summon a fusion monster without the dragon type. Comments are welcome, but also feel free to leave your questions in the Q&A section above! 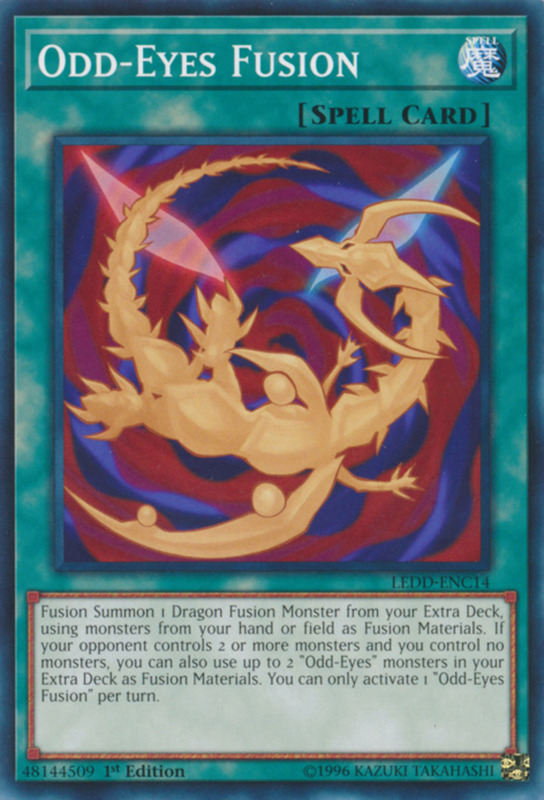 Can 'odd eyes fusion ' fusion summon any fusionmonster other than dragons? ?